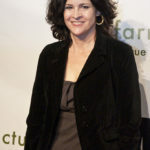 Ally Sheedy is an American film and stage actress, as well as the author of two books. Following her film debut in 1983’s Bad Boys, she became known as one of the Brat Pack group of actors in the films The Breakfast Club (1985) and St. Elmo’s Fire (1985). She also acted in War Games (1983) and Short Circuit (1986). For her performance in Lisa Cholodenko’s High Art (1998), Sheedy won the Independent Spirit Award for Best Female Lead. "My experiences have taught me a lot and I’m happy with my learnings, if not with what I went through to learn."